1. To make the body fold a large paper plate in half and cut on the fold. Color the paper plate halves and then glue the paper plates together. 3. Cut a tail and legs from cardstock. 4. Glue the legs, tail and head to the body paper plate shape as shown in the picture. 5. Cut a long strip from the pink paper to make the tongue and glue it to the inside of the mouth. 6. To make the anthill cut 4 1/2" from the top of a paper lunch bag and fold down the top of the bag to cover the bottom of the bag as shown in the picture. 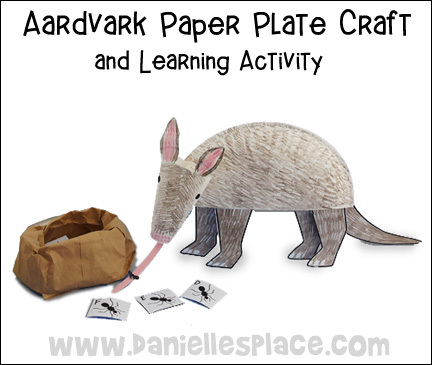 Use the aardvarks and anthill to play educational games such as letter and number review games. Write the ABC's and number on pictures of ants and place them in the anthill. Place double-sided piece of tape on the tongue. Have children try to get an ant out of the anthill by placing the tongue in the bag and trying to get the ant pictures to stick to the tape. When a child has retrieved an ant picture, have him read what is on the pictures. You can also play an addition game by having them add up number on two or more ants. Instant Digital Download $2.00 - - Includes all four animals. 2. Color the pictures, add stripes and spots, and then cut them out. 3. Fold all the patterns in half along their backs. 4. 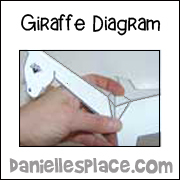 Fold the neck of the giraffe, elephant and zebra on the dotted lines both backward and forwards as shown in the picture. 5. 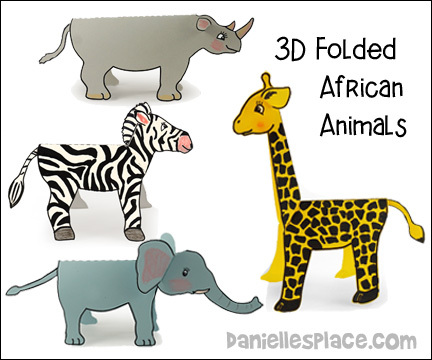 Unfold the giraffe, elephant and zebra and fold up the neck as shown in the picture. 6. Press down on the middle fold and up on the slanted fold to fold up the neck as show in the picture. 7. Glue on the ears. Glue the top of the head together just above the eyes. 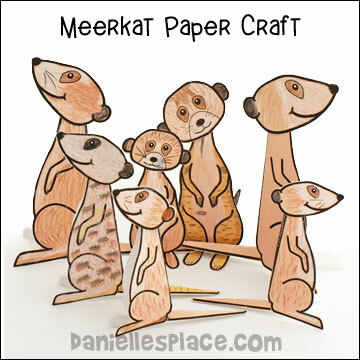 Glue on the tail and spread out the legs so the animals stands up. 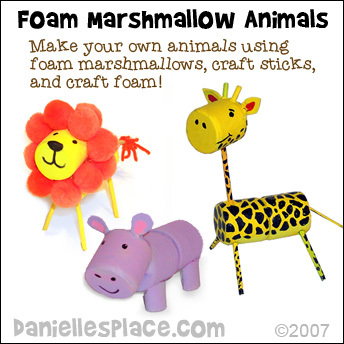 Foam marshmallows are great art media to make all kinds of animals and other creatures. Use wooden dowels or golf tees to make legs and tail. 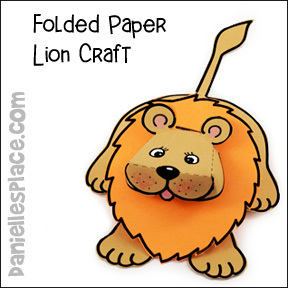 Provide other craft supplies to add details. Pompoms, Yarn, Buttons, Cotton Balls, etc. 1. Glue two Foam Marshmallows together for the body. 2. Cut dowels to make five pieces that are 2 1/2" for the legs and tail, cut one dowel 3 1/2" for the neck and two pieces that are one inch for the horns. 3. Use a pointy stick or large needle to poke holes in the marshmallows for the legs, tail, neck and horns. Insert the dowels. 4. Cut ear shapes from yellow fun foam and glue them to the head as shown. 5. 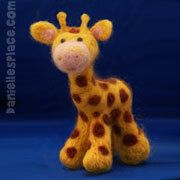 Paint the giraffe's body yellow and the inside of the ears red or pink. Use a brown or black marker to color in the spots and draw on the face. 1. Glue two marshmallows together to form the body. Cut the corner off of one marshmallow to form the head and glue it to the body as shown in the diagram to the right. 2. Use the leg pattern to cut four legs from craft foam. Fold Side A and B in together so they are overlapping each other about 1/4". Glue Side A to side B using a hot melt glue gun. Glue the legs to the body as shown. 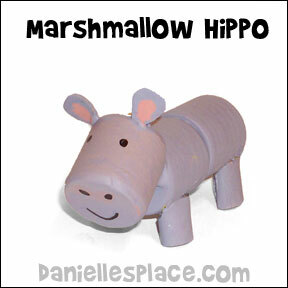 Use a pointy stick or large needle to poke holes in the marshmallows for the tail. Insert the dowel in the hole. 3. Cut the ears from fun foam and glue to the head. Paint the hippo. Use a black marker to draw in the nose, eyes, and mouth. 1. Glue two marshmallows together to form the body. Glue one marshmallow on for the head as shown in the diagram. 2. Cut dowels to make five pieces that are 2 1/2" for the legs and tail. 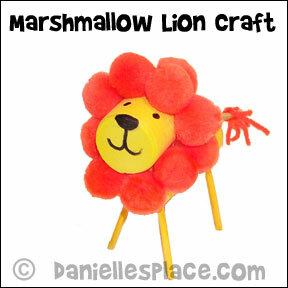 Use a pointy stick or large needle to poke holes in the marshmallows for the legs and tail. Insert the dowels in the holes. 3. Paint the lion figure. Glue orange pompoms all the way around the lions head. Cut ear shapes from yellow fun foam and glue them to the head (optional). 4. Use a black marker to draw in the eyes, nose and mouth. 5. Cut 1 1/2" pieces of orange yarn and glue them to the end of the tail. 1. 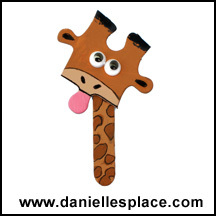 Use a puzzle piece for the head and half a craft stick for the neck. Paint them with acrylic paints or color them with permanent markers. Use a permanent marker to draw in the details. If you use markers that aren't permanent markers draw on the side that doesn't have the shiny coating. The markers will stick better without rubbing off. 2. 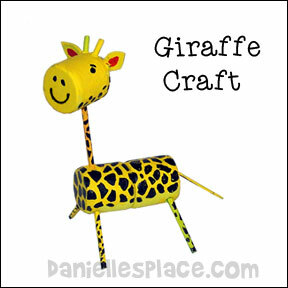 Glue googly eyes to the head when the paint is dry and then glue the head to the craft stick. 4. Glue a pin or magnet to the back of the piece. 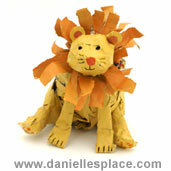 Children color, cut out, fold and glue the patterns together to make this adorable 3D lion. Directions and printable patterns are available to members on The Resource Room and as an instant digital download. 1. Draw the hippo's legs, tail, and head on the purple paper or use white paper and color them purple. 2. 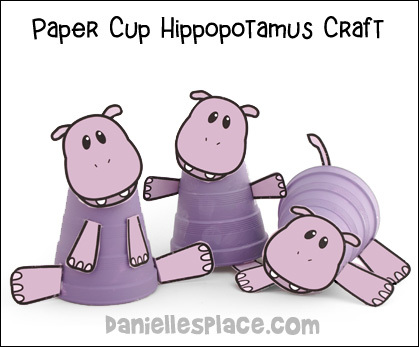 Cut out the hippo's parts and tape or glue them to the cup. 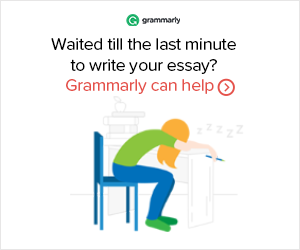 Experience sensational stories, wonderful words, new numbers, and faraway places.